KUALA LUMPUR: The property market in Kuala Lumpur could depreciate as much as 10% to 15% going forward, while the prices of high-end condominiums in the Kuala Lumpur City Centre (KLCC) area may fall up to 30% in the next two to three months, said property consultant Rahim & Co. The rest of the property market in Malaysia was expected to remain stable, it said. “The drop in prices will be more drastic in the KLCC area due to higher price escalation that (it had enjoyed) from 2005 to 2008,” said Datuk Abdul Rahim Rahman, executive chairman of Rahim & Co. He said there had been indications that the asking price for high-end condominiums in the KLCC area had fallen by 30% from the RM2,000 per sq ft they fetched last year. The foreign buyers that had supported property sales in KLCC “are now beginning to reduce and Malaysian buyers are adopting a wait and see attitude,” he said. “Sellers have started to offer lower prices (and the prices) have dropped 10% to 15% in the KLCC area,” Abdul Rahim told reporters during the one-day seminar aimed at updating participants on property trends and issues in Malaysia. However, it was unlikely that the domestic real estate market would drop as much as 45% as had happened in Hong Kong, London and Singapore, he said, adding that real estate prices in those cities were expected to further depreciate by 50% or 60% in the next few months. Abdul Rahim said Malaysian office spaces still enjoyed 90% occupancy rates and rental prices had not dropped as there was no oversupply and many of the leasing contracts were not expiring. Currently, office rental rates in KLCC fetch between RM6 and RM8 per sq ft, while rates in the rest of KL are going for RM4 to RM6 per sq ft.
“However, we know that it is going to be an additional 8 million sq ft of office space in 2011 and 2012, and we expect because of this, there will be downtrend in rental rates even without this economic crisis,” Abdul Rahim said. KUALA LUMPUR: Developers, hit by fallen sales, are scrambling to roll out new and innovative financing packages to move units, especially those already launched but not sold. Sime Darby Property Bhd will up its ante on the competition with the offer of yet another round of attractive schemes under its third Parade of Homes campaign to be launched in conjunction with its participation at the three-day Malaysia Property Expo (MAPEX) beginning on March 6. In addition to a “guarantee buy back” scheme, first introduced and for a limited period under its second Parade of Homes held last year, Sime Darby Property is going further this time round with the offer of a “special down payment scheme”. Under the “guarantee buy back” scheme, the developer will buy back properties bought at 95% of its cost with no questions asked. The scheme will go on till June 15 this year, managing director Datuk Tunku Putra Badlishah tells The Edge Financial Daily. With the special down payment scheme, buyers can pay the balance of the purchase price less the loan amount, in interest-free installments of up to 12 months. The special down payment scheme, however is also for properties that have already been launched, except land, industrial and low-cost properties. Early bird rebates, on a declining scale, will also be offered for all properties purchased during the campaign period. Other offerings include free stamp duty on memorandum of transfer, free legal fee on loan documentations and sales and purchase agreements (SPA) and free stamp duty on loan documents. The developer says they have managed to negotiate for the lowest interest rate with CIMB Bank, Malayan Banking Bhd and HSBC, at BLR –2.3%. “We need to be better than what others are offering and are optimistic of good response given the success of the previous two Parade of Homes,” says Tunku Badlishah. The first two campaigns raked in some RM392 million worth of sales. The first Parade of Homes, held last June, generated RM246 million sales over a 10-day period. The month-long second Parade of Homes in November 2008, showcasing the developer’s 10 townships in the Klang Valley and Negri Sembilan chalked up RM146 million in sales. Meanwhile, more than 40 developers are expected to showcase their properties at the coming MAPEX, organised by the Real Estate and Housing Developers Association Malaysia (Rehda) at the Mid Valley Exhibition Centre. PROPERTY developer Glomac Bhd is planning to sell several commercial property assets in Selangor, sources said. It is learnt that the company is talking to foreign funds and potential buyers from the Middle East, Pakistan, Europe, Australia and Malaysia. Sources said Glomac is looking to sell a 12-storey office tower in Glomac Business Centre for RM25 million to RM30 million, and a commercial block in Kelana Business Centre for RM30 million. Both buildings are currently tenanted. A company source said Glomac will plough back the sales proceeds for new developments to expand its business. "Despite the gloom and doom, there are people keen to buy properties to build their investment portfolio. At a time like this, en bloc deals are more suitable. 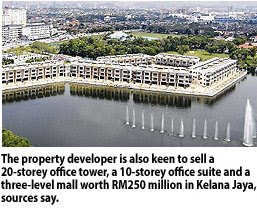 So as a developer, we will continue to look for buyers and build," the source told Business Times. In January, Glomac had inked a deal with Perbadanan Nasional Bhd to sell its 13-storey fully-tenanted Wisma Glomac 3 in Kelana Centre Point for RM50 million. Glomac is also looking for buyers for its yet-to-be-built properties along Jalan Damansara, in Mutiara Damansara and Kelana Jaya. At Jalan Damansara, it plans to sell 10 units of five-storey and two units of eight-storey commercial blocks, and a 15-storey corporate tower for RM140 million. They form part of its RM800 million Glomac Damansara project. The properties will be constructed upon signing sales and purchase (S&P) agreements with the respective buyers. It is learnt that Glomac had signed several S&Ps with local individual investors for a few of the five-storey blocks. Glomac is negotiating with foreign firms to sell the remaining blocks and tower. In Mutiara Damansara, Glomac is planning to sell a 150,000 sq ft corporate tower and office suites with 120,000 sq ft of space, and retail lots covering 40,000 sq ft worth a combined RM250 million. It also wants to sell a 20-storey office tower, a 10-storey office suite and a three-level mall worth RM250 million in Kelana Jaya, on land previously used by Kelana Seafood Centre. CONSTRUCTION outfit Bina Puri Holdings Bhd has bagged a RM693 million contract in Brunei. In a statement yesterday, the builder said it secured the contract to build 2,000 houses for the National Housing Scheme of Brunei from the Brunei Economic Development Board. "The construction period is 24 months. With the new job, our current order book has increased to RM2.7 billion, enough to keep us busy for the next two years," it said. Executive chairman Datuk Mohamed Feisal Ibrahim said the company gave the lowest tender bid price, adding that the award is a testament of its capability in venturing into the overseas construction market, especially Brunei. "We are proud to be involved in construction of the largest number of housing to be built in Brunei and, for Bina Puri, the highest project value secured in one single contract," he said. Bina Puri group managing director Tan Sri Tee Hock Seng said the houses and supporting infrastructure will take up 150ha in Kampung Pandan, Belait. The development will comprise 1,200 terrace and 800 semi-detached houses. Tee said that Bina Puri's maiden project in Brunei in October 2007 involved two contracts worth RM33.6 million for the Sungai Liang Industrial Park in Belait. The project was completed in August last year. The group is also undertaking projects in Thailand, the United Arab Emirates and Pakistan, Tee said. Bina Puri has more than 30 years building experience, mainly civil engineering and building works for diversified multi-million-ringgit construction projects. They include mega infrastructural works like highways, airport works, waterworks, hospital, high-rise buildings and land reclamation projects, both locally and overseas. KUALA LUMPUR: The property market in Malaysia, like much of Asia, is facing a slowdown, but the country can still use various initiatives to ride out the economic crisis and help the sector, industry players said. Ascendas Pte Ltd, Singapore, South-East Asia operations chief executive officer Ong Beng Kheong said Malaysia could do more to make its property sector more attractive and competitive, especially in the area of image. Beneton Properties founder and executive chairman Datuk Chan Sau Lai said some of the legislation in Malaysia had resulted in foreign investors being reluctant to invest in the country. “Our income tax regime, for example, is much higher compared with say, Hong Kong and Singapore. Both are perceived to be friendly cities for foreign investors and we must find ways to become more friendly to woo these investors,” he said. Hong Kong Savills Valuation & Professional Services Ltd deputy managing director Simon Smith said there were still large current account surpluses in Singapore, Hong Kong, Malaysia and China and large foreign exchange reserves in Japan and China, which meant Asia was in better shape compared with the US and Europe. “There is still plenty of infrastructure required as targets of stimulus measures and historically, post-slump, Asia emerges with a greater share of the global growth domestic product,” he said after presenting his paper on global market changes and the perception on Malaysia. KUALA LUMPUR: The Real Estate and Housing Developers’ Association Malaysia (Rehda) welcomed the announcement by the Housing and Local Government Ministry on stimulating the property market. “The ministry’s decision to get banks to reschedule payments and reduce interest rates will make housing loans more affordable and avoid the occurrence of non-performing loans in the housing and construction sectors,” president Datuk Ng Seing Liong said in a statement. Ng added that the move would create greater financing for the housing sector while the reduced rates would also attract potential buyers who have been adopting a wait-and-see attitude. Meanwhile, the Government’s decision to subsidise the construction or purchase of land for building 25,000 low-cost houses, was also seen as a positive step towards providing more affordable housing for low-income earners. Ng further stated that the revision of stamp duties and taxes for developers would ease the industry’s burden as well.